In an SCCM Current Branch 1602 environment with a Server 2008 R2 Software Update Point (have not upgraded to Server 2012 R2 yet), in a different site I had about 120 clients at a specific site that were not successfully scanning for updates. I usually run the built in report “Last scan states by collection” to make sure the clients are scanning for software updates without issues. OnSearchComplete – Failed to end search job. Error = 0x80244019. Scan failed with error = 0x80244019. In my site we are using a WinINET proxy script which sets the proxy for the Internet , and we also set the WinHTTP proxy. Our WinINET proxy had a bypass list for the WSUS server but our WinHTTP proxy did not for this specific site. To add the bypass list to your WinHTTP proxy, you can either set it manually through command prompt, or through group policy. After restarting the computer for the proxy settings to take affect and doing another Software Update evaluation scan on the client, the WUAHandler “Successfully completed scan.” on the clients. This entry was posted in SCCM Current Branch and tagged 0x80244019, Software Updates on 13/09/2016 by nhogarth. I installed a trial of Configuration Manager 2016 Technical Preview 4 and set up and configured the Software Update point. I wasn’t able to synchronize any updates. The workaround was to configure the Software Update Point and disable/remove all Classifications and Products and then to schedule another sync. After this, I scheduled another sync, and the sync completed. I then went back and re-configued the Software Update Point for the Classifications and Products I wanted, then scheduled another sync and it worked fine. This entry was posted in SCCM 2012, SCCM Technical Preview, Software Updates and tagged SCCM 2012, SCCM Technical Preview, Software Updates on 15/11/2015 by nhogarth. So if there were no updates available to be installed, why were my Software Update compliance reports showing the client as non-compliant and the Deployments in the Monitoring node in the console saying the client In Progress for a Software Update group deployment? Successfully raised Resync state message. I then checked the SCCM 2012 console in 15 minutes and the Deployments section in the Monitoring node showed the client as Successful instead of In Progress, and the SCCM 2012 update compliance reports showed the client as Compliant. 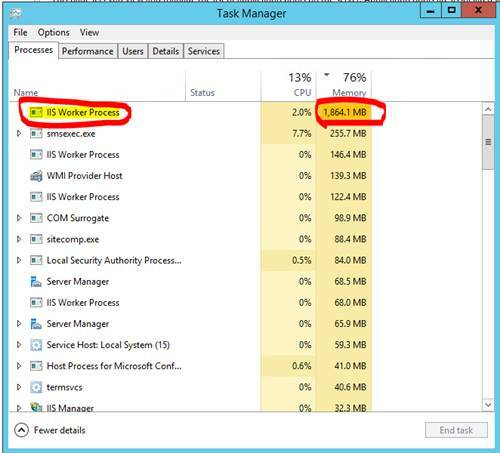 This entry was posted in SCCM 2012, Software Updates and tagged SCCM 2012, Software Updates on 14/11/2015 by nhogarth. OnSearchComplete – Failed to end search job. Error = 0x80244019. Scan failed with error = 0x80244019. Another day another scan issue on a Windows Server 2008 R2 with SCCM 2012 client installed. WARNING: Reporter failed to upload events with hr = 80244019. This entry was posted in SCCM 2012, Software Updates and tagged 0x80244019, Software Updates on 29/08/2015 by nhogarth. I was told by a client that they were having issues synchronizing software updates using SCCM 2012. 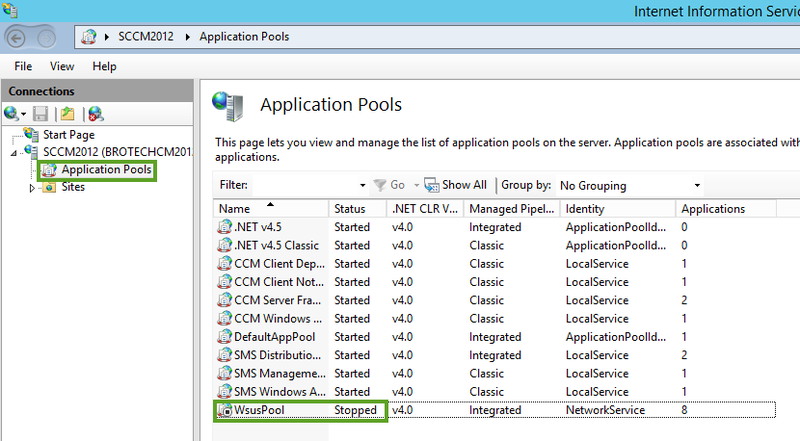 On the SCCM 2012 server running the SUP role, I opened up IIS Manager, looked at the Application Pools and noticed that the WsusPool was set to “Stopped“. I started it again and thought it was fixed, but the client advised me that it had crashed again shortly later. 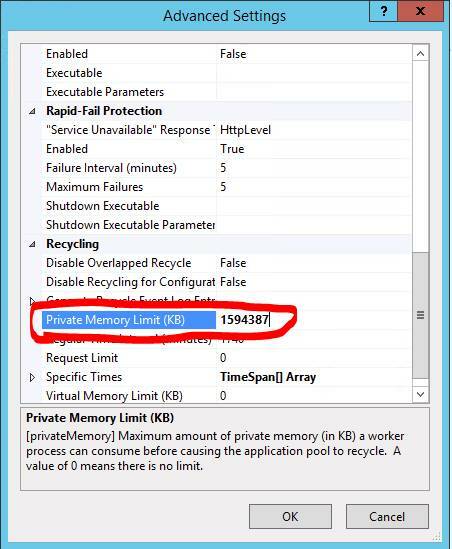 I checked Task Manager on the server and noticed that IIS Worker Process was using 1864.1MB of memory. I then right clicked on the WsusPool back in IIS Manager, then Advanced Settings, and noticed that the memory limit was set to a lower ammount. I increased this limit to 4GB to be safe, restarted the WsusPool and then the SUP was able to syncrhonize fine. The Wsyncmgr.log looked good and the problem never came back for the client. This entry was posted in SCCM 2012, Software Updates and tagged IIS, Software Updates, SUP on 21/06/2015 by nhogarth.